Buying a Kiliflyer was a stroke of luck, rather than a conscious decision. 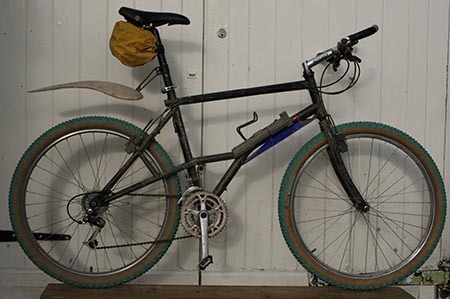 It was October 1992 and I was keen to get hold of a Kona Cinder Cone, a mountain bike that seemed to be very progressive at the time, but as we approached the end of the model-year none of the suppliers seemed ready to shift on their prices – curiously Evans dropped their prices a week later, but by then I’d already bought the Saracen. As I said, the Saracen was a stroke of luck – a good friend was also looking to buy a similar mountain bike and, when searching round, a bike shop had offered him the Kiliflyer Pro at the price of a lower-spec version, just £490 (which looking back on it was a heap of money in 1992)… a price that he honoured not only for Steve, but also for me. So I ended up with a shiny black Saracen arriving at the office – quite a parcel in the days long before online shopping meant a stream of curious shaped parcels arriving at work. 1 – The raised chain stays never ceased to suprise other cyclists and moreorless cancelled out chainsuck & avoided a lot of mud-clogging. 2 – Having hydraulic brakes was unheard of, but the Maguras on the Kilflyer proved to be bomb-proof and easy to maintain. I never had to bleed in the 20 years I had the Saracen, and swapping worn pads was dead easy.